Well it’s a reality and there’s two companies Water to Go and Aquapure lining up reasonably priced super fancy nano technology filters that remove everything from chemicals to microscopic viruses. These filters haven’t been around too long and I still think people, including myself struggle to believe their claims despite all the testing and certification saying otherwise. 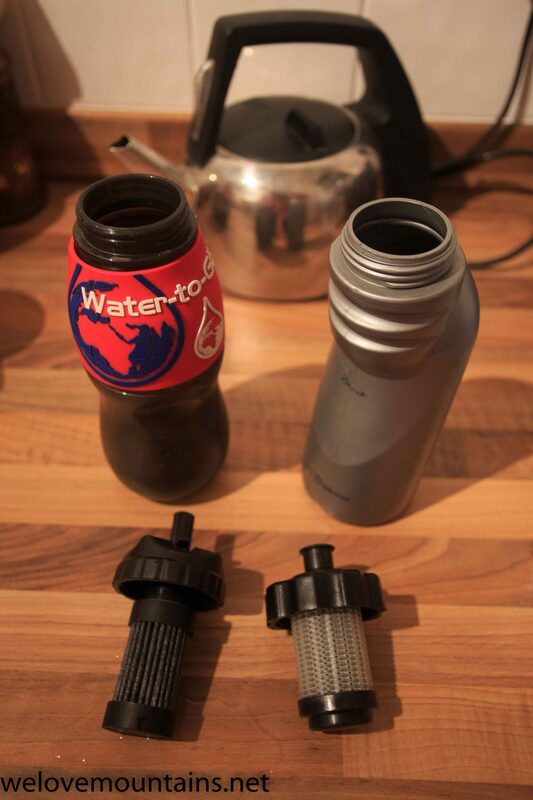 For my day to day use they are fantastic becasue I can carry very limited water while out hiking or biking from my home in Scotland and simply fill up from random streams in the hills. I used the Aquapure bottles on my five months travelling by bike towards India, while I have been using the water to go bottle since as a comparison. 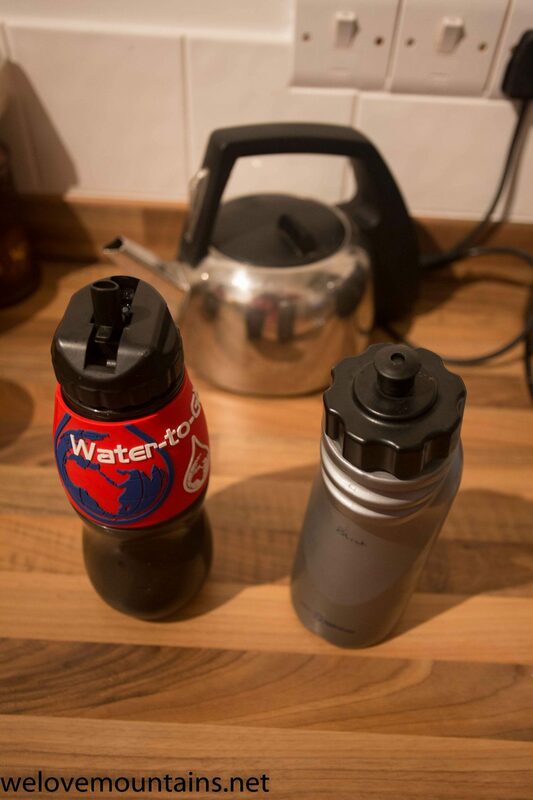 Firstly I will discuss the Water to Go bottle which I have been using as a handy water source while cycling in Scotland. Scotland has an abundance of fresh looking water, some is very clean to drink but more is tainted by livestock. This clear flowing water that hides bacteria and other nastys is ideal for using this bottle. My main source has been small streams in the tweed valley while mountain biking. Last week in Innerleithen I stopped halfway up a climb, enjoyed a quick stream sourced cold drink before setting off, ten metres upstream lay the decaying carcass of a unrecognizable sheep body. It made my stomach wretch to think I had just drunk water here and wondered if I could trust the Water to Go bottle? Well I didn’t get sick, so I guess the filter does what it says! The bottle is a rigid plastic design, free from nasty BPA chemicals. It has a folding spout for drinking that keeps out of the way when folded down, although the spout isn’t totally covered so can still get dirty which is a shame. The filter is attached just inside the lid and is a matchbox sized concertina of material. It isn’t super robust, I twisted it and folded a bit when re-attaching so take care. Subsequent design look to have addressed this vulnerability. In use the flow rate is remarkably good. Rather than squeezing the bottle it its gravity and your sucking that draws the water out at a surprisingly similar rate to a normal bottle. There is a one-way valve to let air in which makes a spectacular squeaky noise but does its job of maintaining a steady water flow. This one way valve is a useful addition over the Aquapure bottle. The seals seem good with no leakage issues if tightly screwed down. However the spout doesn’t seal when closed, meaning water can still trickle out sideways – so always store upright. The build quality seems good so far with no issues other than the filter being a little fragile. The bottle is backed up by claims of filtering 99% bacteria and viruses and also chemicals like Chlorine and heavy metals too. It really means you can drink from anywhere. Viruses and small stuff are filtered by the active nano technology which is the super clever bit, I think they quote NASA on the webesite too. It claims a few more chemicals filtered over the Aquapure but the essentials are all covered by both. It’s hard to say if simply not getting sick is a positive result but that’s all I can go on so far with this bottle. Keen followers of WeLoveMountains will know I took the Aquapure bottles with me cycling from the UK to Kazakhstan then Nepal and India. They were used daily for at least four months, a thorough test in a tough environment. In Nepal the bottled water quality was tested in a study and found that 6 out of ten bought bottles contained faecal bacteria and 9 out of ten were contaminated in some way! We discovered this after chatting to some Canadians and we subsequently filtered all water! The Himalayan streams provided the freshest cleanest water around, but who knows what the Kathmandu water contained – in most hotels the sinks and toilets were stained brown from the constant brown tainted tap water that dripped! The Aqua pure water bottles are soft plastic, highly robust and squeezable in a standard sports bottle style. After four months only the logos wore off, nothing else broke or wore out. Flow rate did decrease with usage though. They are designed in a well thought out ergonomic shape to help squeeze the bottle, as this is essentially how the water is forced through the filter. It is at a noticeably slower flow rate than the water to go bottle, and without the one way air valve you have to squeeze the bottle until it’s fully compressed, then stop drinking to let it refill with air before squeezing to drink again. So its a fair bit slower than Water to Go. The spout is a standard push and pull like all cycling bottles so seals well but doesn’t fold away so was susceptible to getting contaminated easily, but this design is easier to drink on the bike. Pros and cons! A cao over the top would be useful though. Comparable claims to Water to Go but maybe claims less chemicals filtered, both are certified by Tropical medicine council, which shows they stand up to testing and do the essentials for good health like bacteria and virus. Check out the website for specifics. The filter is under the lid again and is enclosed in plastic mesh and is more robust than the water to Go. The filter life is comparable and ends when water stops flowing after about 250 litres. However the filter on the Aquapure seemed to slow earlier than I have found with the Water to Go bottle. The price is about £25 each if you shop around for the Aquapure traveller, so much the same and filter life is claimed to be similar, so where is there a difference? For me if I need to grab one for a days riding I grab the Water to Go which is probably telling. It is the faster flow rate that wins for me, it is quicker and easier to drink. It also seems to not lose flow rate so quickly after the filter gets older too. The folding spout stays slightly cleaner, but not as clean as it would be if either had a cover though! The Aqua Pure has a slightly more robust filter design but has one other main redeeming feature: by squeezing the flexy bottle you can filter water into a separate container. I often (slowly) filled up 2 litre bottles to drink later while cycle touring, as water was not always available. You can’t do that with the Water to Go very easily, so on longer tours where robustness is needed and water is sparse maybe I would stick with the Aquapure.